Monday January 24th 1921 It was a wonderful day. I helped Aunty some with the washing. Ida did not get up till noon. After dinner I ironed my things and wrote Alice Condon, Jim Dunlap at Sea Breeze and sent check for Delavan paper. 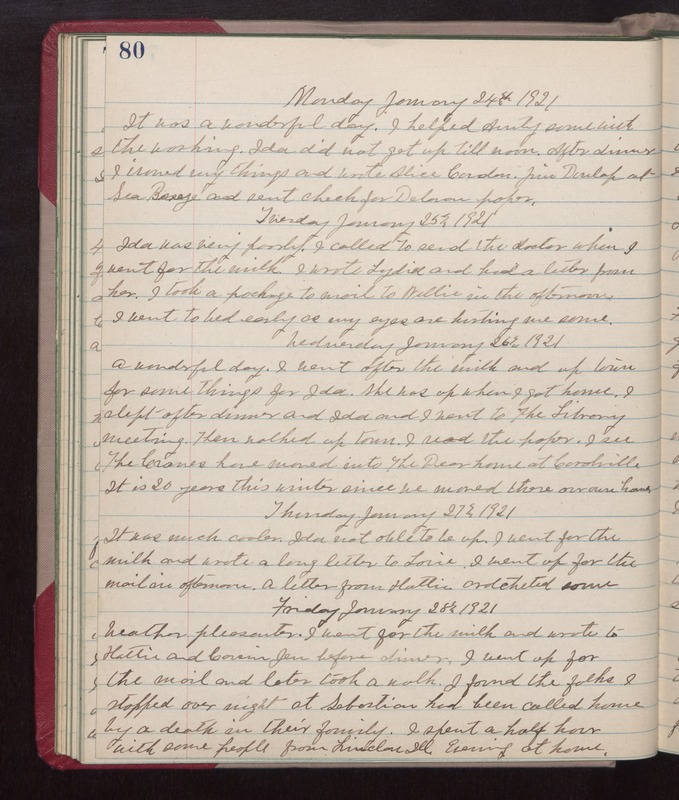 Tuesday January 25th 1921 Ida was very poorly. I called to send the doctor when I went for the milk. I wrote Lydia and had a letter from her. I took a package to mail to Nellie in the afternoon. I went to bed early as my eyes are hurting me some. Wednesday January 26th 1921 A wonderful day. I went after the milk and up town for some things for Ida. She was up when I got home. I slept after dinner and Ida and I went to The Library meeting. Then walked up town. I read the paper. I see The Cranes have moved into the Dear home at Coralville. It is 20 years this winter since we moved there our own house. Thursday January 27th 1921 It was much cooler. Ida not able to be up. I went for the milk and wrote a long letter to Lorie. I went up for the mail in afternoon. a letter from Hattie. crotcheted some. Friday January 28th 1921 weather pleasanter. I went for the milk and wrote to Hattie and Cousin Jen before dinner. I went up for the mail and later took a walk. I found the folks I stopped over night at Sebastian had been called home by a death in their family. I spent a half hour with some people from Lincoln Ill. Evening at home.